Water management officer James Dyer assesses a Golden perch captured during monitoring. Golden perch netted during monitoring of wetlands between Hay and Balranald. Golden perch are thriving in waterways west of Hay, thanks to targeted flows supporting fish habitat. Creeks and wetlands between Hay and Balranald have been closely monitored to assess the role of targeted water deliveries to the area since the 2010 floods. And it’s good news for golden perch, or ‘yellow belly’. James Dyer from the Office of Environment and Heritage said evidence of fish recruitment was emerging. “Our recent monitoring of environmental watering responses showed at least half the fish captured were golden perch,” Mr Dyer said. “They ranged in length from 10 to around 30 centimetres. The larger fish probably entered the system during floods in 2010 and 2012 but the smaller fish are likely to have resulted from targeted environmental flows in the years since,” he said. Pulses of water – or ‘freshes’ – running through the river are known to trigger breeding of golden perch. These flows can also help to carry the eggs and larvae along the river or creek. Higher flows can also carry drifting eggs and larvae out onto the productive floodplain wetlands. These juvenile fish later return to the river as a new generation of young fish. “NSW and Commonwealth planned water deliveries appear to have carried golden perch eggs and larvae into floodplain wetlands and creeks where they have developed,” Mr Dyer said. “But providing this water isn’t just about transport. Water deliveries over the last 10 years have boosted the health of the wetlands themselves. Aquatic plants, plankton and insects are more abundant, all of which provide a source of food for native fish. So not only have the golden perch been able to breed, but water for the floodplain environment has provided a healthy habitat to sustain and nourish their young,” he said.
. . . not only have the golden perch been able to breed, but water for the floodplain environment has provided healthy habitat to sustain and nourish their young . 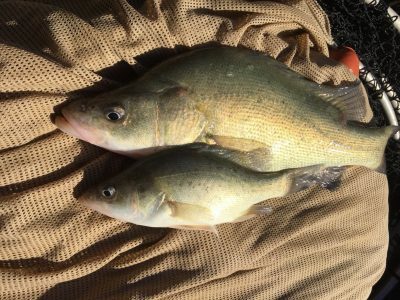 . .
Golden perch may travel thousands of kilometres throughout the Murray-Darling river system either as drifting larvae or as actively swimming juveniles and adults. The young golden perch recorded in these wetlands may one day colonise other rivers and floodplains connected to the Murrumbidgee. “Our next objective is to help these fish find their way out of the local wetlands and back into the river using follow-up environmental watering events,” Mr Dyer said. “The detection of these fish demonstrates a great outcome which allows us to now focus our efforts on supporting healthy habitat for these important native fish. It also provides a good example which we can try to replicate again and again by smart use of environmental flows,” he said. Dr Katherine Cheshire from DPI Fisheries said fish played a critical role in the whole river system and were the basis of a billion dollar recreational fishing industry. “Fish help to cycle nutrients within the river system and provide food for other parts of the food web including waterbirds,” Dr Cheshire said.
. . . looking after fish with environmental water provides a range of environmental, social and economic benefits, including better fishing for target species like yellow belly . . .
“Looking after fish with environmental water provides a range of environmental, social and economic benefits, including better fishing for target species like yellow belly. We know that restoring fish populations through environmental water delivery and via the protection of natural flows can be an effective way to manage river health. The success of environmental watering in the Murrumbidgee is a credit to the collaborative effort of scientists, environmental water managers and environmental water holders in both the state and the Commonwealth,” she said. Commonwealth Environmental Water Holder David Papps said this event was just a hint of what was possible when governments, scientists and communities work together. “The environmental water supplemented irrigation and domestic water that was in transit at the time, allowing us to create the conditions needed to encourage fish movement, spawning and recruitment,” Mr Papps said. 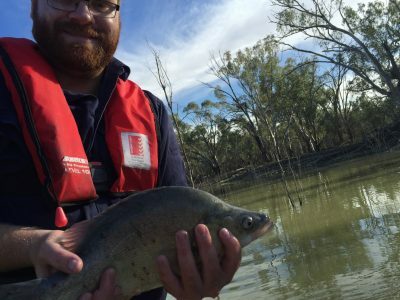 “Complementary monitoring undertaken by Commonwealth and State governments has recorded good young of year recruits of large bodied native fish including Murray cod and golden perch in creek, lake and wetlands systems in the lower Murrumbidgee.
. . . it’s great news for anglers, particularly if we can encourage these fish to return to the main river channel in the future . . .
“This is not only good news for the fish communities, it’s great news for anglers, particularly if we can encourage these fish to return to the main river channel in the future,” he said. Young golden perch in the lower Murrumbidgee have a chance to move from their wetland feeding grounds back into the river with the help of high river flows. Increased river levels in the valley are the result of translucent and unregulated tributary flows following recent wet weather across the region. OEH Environmental water manager James Dyer said the higher flows had provided connectivity between the river and some creeks and wetlands in the region. “This has given a recently discovered population of golden perch recruits near Hay an opportunity to move back into the river,” he said. “This is a great result for this species as it is understood they need to return to the river to complete their life cycle. Although high flows in winter do not trigger breeding events, these flows are likely to provide an important boost to productivity in the river. A healthy, productive river provides food and habitat for the lifetime of the fish and aids the survival of young native fish that were spawned the previous spring,” Mr Dyer said. OEH will continue to monitor native fish populations in the area and their responses to varying flows within the floodplain river system.